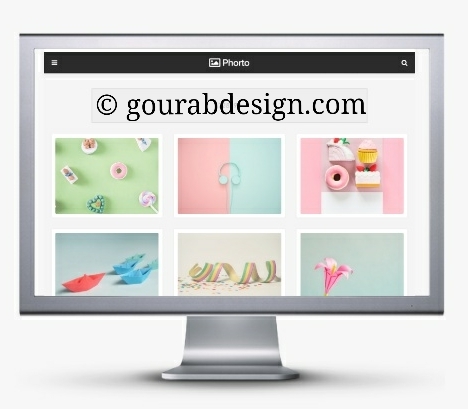 Do you have a photography website and you are searching a different theme for your website.So today's post is just for you.Because some of my visitors have requested from me.Tell a nice and nice design model.If you are one of these then you have come to the right place.So let's see what is its features?.. Phorto - Photo Gallery Blogger Template is a minimalist design and dynamic grid look. This theme has been created taking into account the Creative Photography ,Portfolio website and creating image sharing, printing, wedding, etc. It can be used to do it. It is based on the latest version and updated with many features installed. What's new 👉 clear and very clean code. No sidebar. Optimizes js. H1 and H2 Tag Also Optimized. It is a 100% responsive system and supports screen size, as every device has suitable. Means mobile friendly. For photographers, creative designers, design agents, some easy steps can be installed. It provides a clean and simple look with the backlight, a beautiful luk that will make your photos look real and sweet. This is a plain, codified, and clean with a versatile design that is both stylish and easy to use. This topic is specially created for blogging, photo sharing and travel, nutrition, lifestyle, sports, personal blog, etc. or photo shoots, and of course, the perfect and elegant website or blog about uploading images. Phorto is a model of the least and professional , especially based on niche blogs. It is the perfect place to share, galleries, travel wages, beauty blogs, etc. Phorto comes with several widgets that will help you post your blog more professionally. You made a good decision by choosing our model. You can check the live demo or download the using the button below and carefully read the documentation to configure your blog.